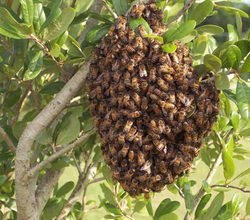 If you ever see a honey bee swarm, do not be alarmed. This is a natural process by which honey bee colonies divide and expand. Its a good sign, that a portion of a honey bee colony has taken flight in search of a new home. The honey bees are generally docile once they land. Generally you'll see a football sized cluster of bees hanging from a branch, fence, shrub, or building. An informative Wikipedia article can be found Here. To have a swarm of honey bees removed, its only necessary to contact a local beekeeper and they will come and remove them. Please do not ever spray or kill the honey bees. Do not be alarmed by their buzzing sounds. The bees are tired and docile and only interested in finding a new home. We need the bees and this is one time where they need to rely on us to do the right thing. In our local area, just consult our PHBA member roster and contact a beekeeper that may live close to where the swarm has been found. Our member roster can be found Here. There is also a link to the roster on the "References" page. Thank you for protecting the honey bees! We depend on them to pollinate our food crops, they depend on us to help them out when they swarm like this. A video of a back yard swarm can be seen below. You'll see how the beekeeper, even without any protective gear, sets out a new hive box for the bees to enter. After the bees have all entered the new hive, the beekeeper will simply take the hive box away.